Tabletop document punching just got easier and more affordable. Introducing the FlexiPunch-M; an innovative modular punching machine with manual operation at an affordable price that gives you the binding options you need. The high-quality precision die sets available with this machine will last for years of production. Finally, you are able to punch your mid-volume jobs with a variety of binding methods by simply switching the punching die on this portable unit. The FlexiPunch-M has a recommended punching capacity of 15 sheets (20#) at a time for all punching dies. The interchangeable die sets were created with a quick die change design that allows you to easily change from one punch pattern to another within seconds- no tools needed! Fully disengageable pins on all punching dies allows for punching of all paper sizes without partially punched holes at either end. The FlexiPunch was build to last with a rugged design including all metal parts, heavy cast side plates, and non-skid feet. 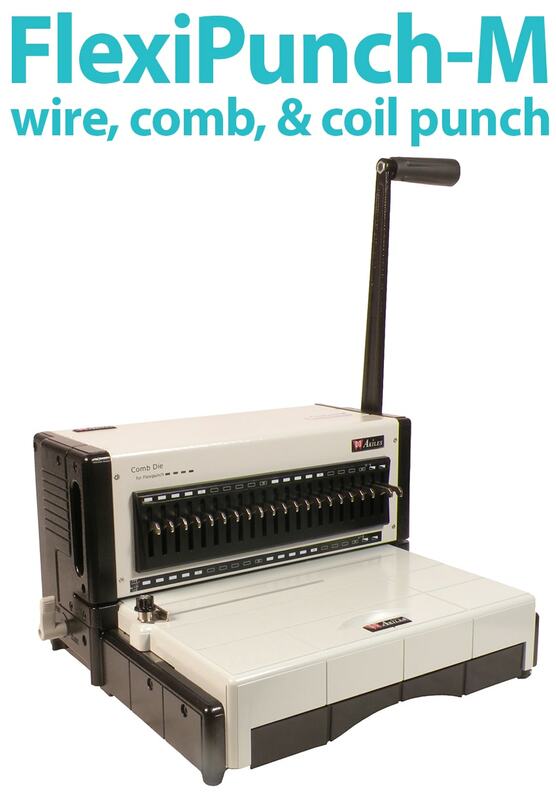 The Akiles FlexiPunch is a durable machine that is perfect for small to mid-sized offices with mid-volume punching needs that do not justify the higher cost automated or heavy duty equipment. 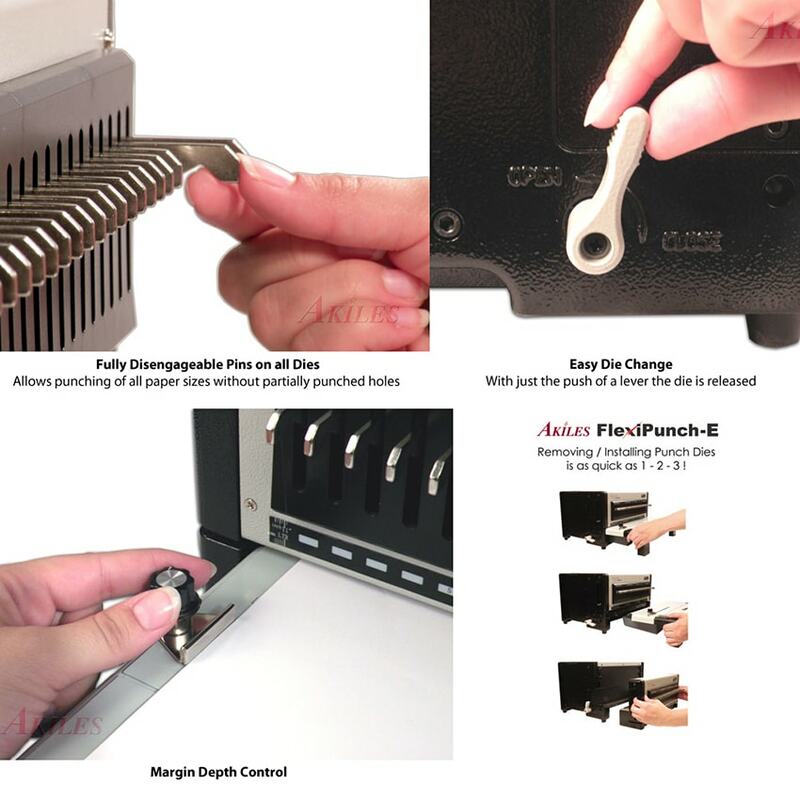 The Akiles FlexiPunch-M has 4 different punch dies to choose from, including plastic comb, 2:1 Wire-O, 3:1 Wire-O, and 4:1 Spiral Binding Coil. The adjustable depth margin is available for all punch dies and provides the correct punch margin depth for each element or book size. • Shipping Weight: 35 lbs. Punching dies are available in four different binding styles, including Wire-O 2:1 pitch, Wire-O 3:1 pitch, Plastic Comb, and Spiral Coil Binding. Below are the specifications regarding these Flexipunch dies, including the pitch and hole patters, hole shape, as well as the minimum and maximum document thickness. The great thing about the Flexipunch-M Manual Interchangeable Die Machine is that you can use one, or all of these dies with the easy change-out system that lets you switch binding methods in just seconds.